Each successful presidential nominee is acutely aware of the importance of trusted advisors from the outset, and their expertise is highlighted by their choice in running mates. The most effective and popular tickets have included vice presidents who balanced the views of the candidate they ran with, but were not identical - they support where the other is weak, and further highlight the value of their strengths. A balanced ticket is a principle that can apply to all industries, not just politics. Marketing in particular, can learn from the presidential wins and losses of the past. The bottom line is that, by using a successful partner strategy, you can provide a foundation, safety net and support system to ensure your business goals are met, no matter what they are. 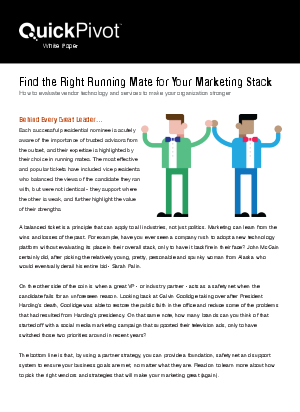 This white paper provides steps to take when determining the need for a new marketing running mate, including return on investment in the short and long term. It also provides insight into areas where your tools, internal teams and processes can also become stronger when working together, such as print and digital marketing, big data and customer experience personalization or analytics and creative design. Download to learn more about how to pick the right vendors and strategies that will make your marketing great (again).